Creating an electronically-fillable, information retrieval template is easy with Signature. With an intuitive drag-and-drop interface, with powerful customization option, preparing your templates has never been easier! 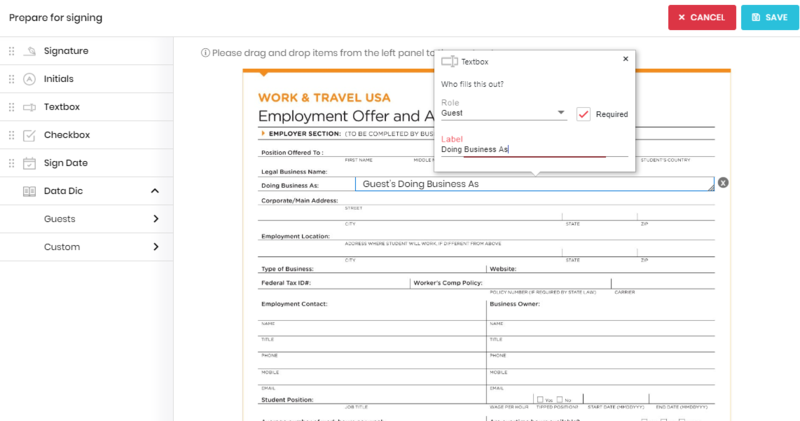 The form editor uses a combination of drag-and-drop data fields, and customizable labels to allow you to easily place and identify the different signer and data fields in your template. Click on each field to specify which Signing Role is responsible for completing the field. You can edit the label of the field, and this will update the visible label when the recipient opens the form. Click on the field again to collapse the Signing Role. Insert a Textbox to retrieve custom information from your guest. Modifying the Label field will allow you to create custom Guest Attributes in the Tokeet guest details page. Any information entered by the guest will be visible there. Insert a data code from your Tokeet account by adding data dictionary fields. Click the Data Dictionary button to view the full list of selectable data codes, so that you can click and drag the data code you wish to insert. Guest data fields will update the matching field in the Tokeet guest details.